Today we’d like to introduce you to Toby Gotesman Schneier . Toby Gotesman Schneier, please kick things off for us by telling us about yourself and your journey so far. And it hit me like a ton of bricks that “Tragedy happens in COLOR”…that blood is RED… that the worst of times happen under cornflower BLUE SKIES, just as the best of times…. 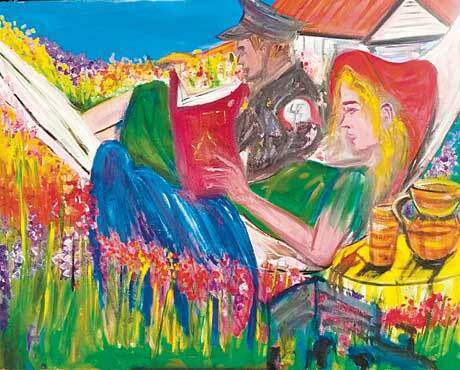 Hence, I began to paint the HOLOCAUST… Again, NOT a conscious decision, but rather, a need of sorts…. 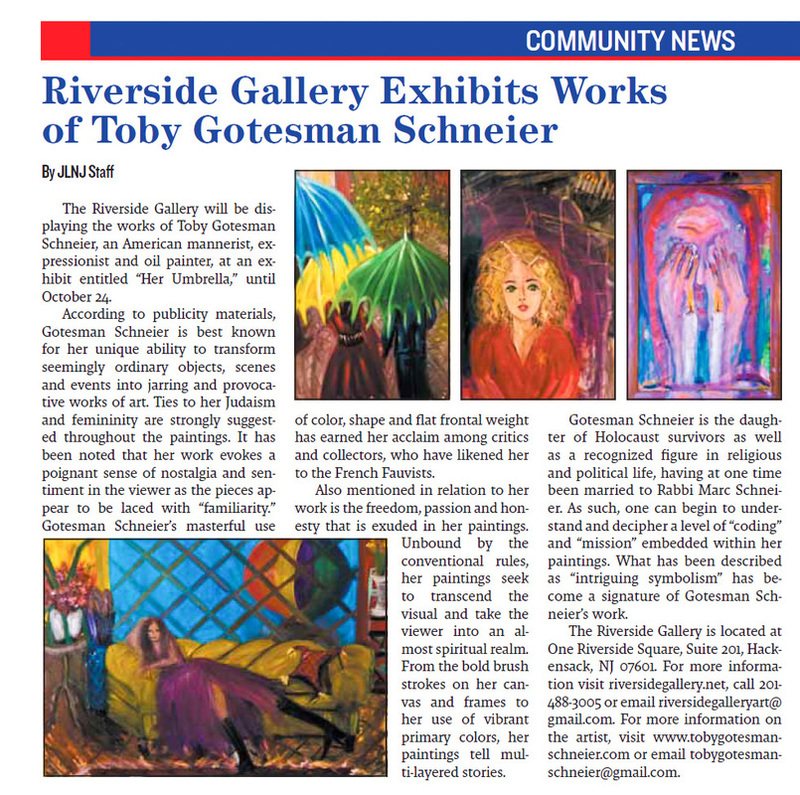 Jewish American painter Toby Gotesman Schneier‘s solo exhibition is running from October 8th ~ October 24th at the Riverside Gallery in Hackensack, New Jersey. 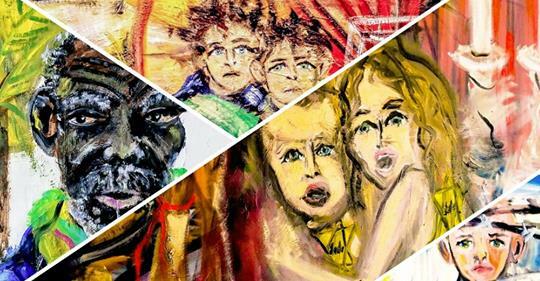 Being the daughter of Holocaust survivors, Toby’s acclaimed pieces include “Auschwitz”, a portrait capturing the moment of a Jewish mother and daughter right before getting sent to the concentration camp. 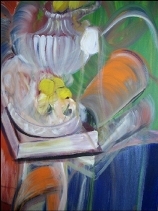 Her other notable pieces include “Berlin 1941” and “Mother’s Day”. 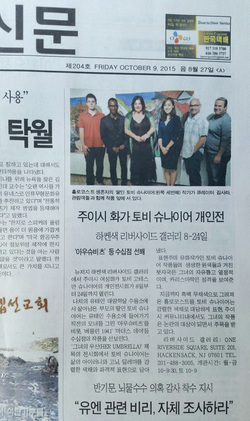 The title of the solo exhibition is “Her Umbrella”. 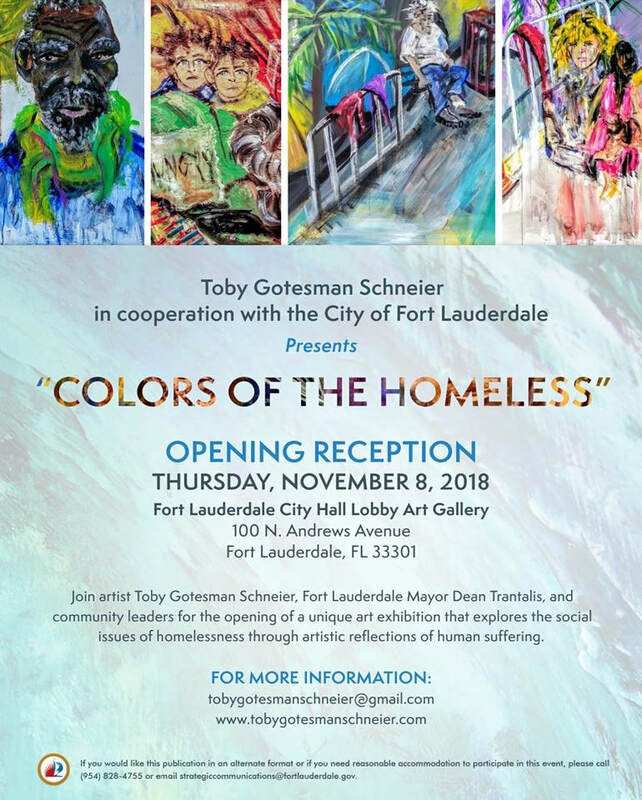 Through this show, Toby Gotesman Schneier expresses life’s irony, conflict and dilemma with strong and vibrant use of colors. 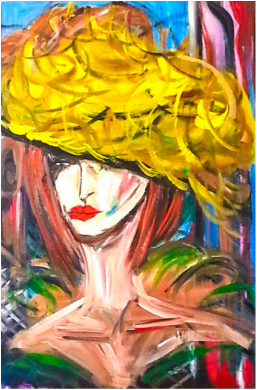 As an expressionist oil painter the passionate and charismatic character shows through in her vivid primary colors and raw brush strokes. Toby’s work have been acclaimed and also controversial in the Jewish community for her use of bold colors instead of black and white which were stereotypical of other holocaust pieces. “Hiding in Plain View” by Toby Gotesman Schneier.This month’s exhibition at the Waltuch Gallery at the Kaplen JCC on the Palisades in Tenafly features an exhibition of mannerist/expressionist oil paintings by Toby Gotesman Schneier. 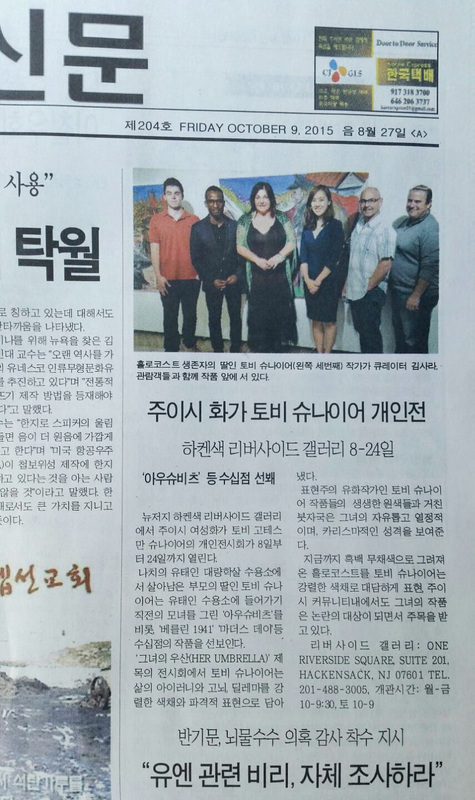 The exhibit, “Enveloped in Quandary,” will be on display through May 28. An opening reception will be Tuesday, May 5, at 6 p.m. For information, call Jessica Spiegel at (201) 408-1426 or go to www.jccotp.org. ,דער מאמענט' איז א ניימאדישע און אוואנגארדיסטישע צייטונג מיטן אלטמאדישן יידישן חן און טעם. ס'איז טאקע מיט ממתקים א מחיהדיקע וועלט; אין יאר 2015 עקזיסטירט א יידישע צייטשריפט מיט אזא גרויסן טיראזש! אזוי ווי מ'זאגט היינט-צו-טאג, אז די היינטיקע קעשענע-טעלעפאנען פארמאגן א סך מער קראפט און פונקציאנירן פיל שנעלער פון די ערשטע איבערקאמפוטער אין די 50ער יארן, איז אייער ,מאמענט' נאך גרעסער, שענער און רייכער ווי די פרעסטיזשפולע טאג-צייטונגען, וואס האבן געדינט פארן חורבן די פשוטע פאלקס-מאסן אין מזרח-אייראפע. יא, ס'איז דער אמת מיט אן אלף, אז אפילו אין יענע זיסע יארן, ווען ס'האבן געבליט די גרויסע טאג-בלעטער אין ווארשע און ווילנע, איז קיינמאל ניט דערשינען אזא צייטונג ווי ,דער מאמענט'. די נייע טעכנאלאגיעס דערמעגלעכן אונז ארויסצוגעבן אזא צייטשריפט. "Schneier's work is reality-based 'mannerism', quite reminiscent of the 'french fauvists', eccentric, bold and eerily nostalgic." "The oil-on-canvas paintings on exhibit in “Juxtaposition,” our new exhibit featuring the work of emerging artist, Toby Gotesman Schneier, reveals Ms. Schneier’s playful eye and original take on the items and people she sees every day. Her exuberant playfulness as she revels in the contrasts between objects, especially when they create a poetic or ironic counterpoint of impressions and ideas makes her work interesting and even fun to view. Her sensuous use of color, organic shapes and kinetic line reinforce the overall impression of a newFauvist. "hat anchors them down. Otherwise, her topical lightness might pass for a wan sentimentality - now what she's after. There are passing references to Cezanne in her still-life paintings, when her colors are more muted, and a whole lot of Fauvist coloring in the rest." This exhibit is humorously and appropriately entitled “LEMONS AND RHETORIC” which will be on view at the Phoenix Gallery from September 3-27, 2008. Schneier’s work is reality-based ‘mannerism’, quite reminiscent of the ‘french fauvists’, eccentric, bold and eerily nostalgic. One can expect to see the ‘in’ crowd at the opening on September 4th, as Schneier has quite the extensive fan base of ‘glitterati’. "The oil-on-canvas paintings on exhibit in “Juxtaposition,” our new exhibit featuring the work of emerging artist, Toby Gotesman Schneier, reveals Ms. Schneier’s playful eye and original take on the items and people she sees every day. Her exuberant playfulness as she revels in the contrasts between objects, especially when they create a poetic or ironic counterpoint of impressions and ideas makes her work interesting and even fun to view. Her sensuous use of color, organic shapes and kinetic line reinforce the overall impression of a Fauvist." "Toby Schneier is the famed co-founder of the Hamptons Synagogue and the New York Synagogue. Toby’s paintings bring meaning and life to the mundane with their complex psychology and juxtaposition." 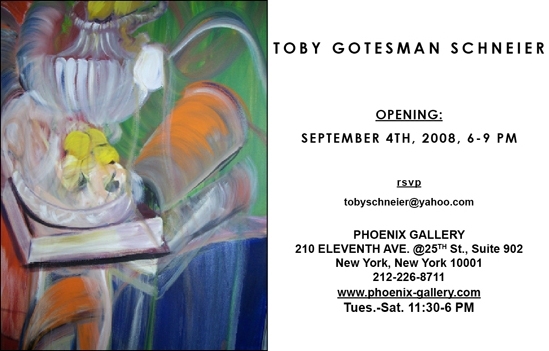 "Toby Gotesman Schneier paints scenes and still lives filled with color and detail. Her narrative images are based on the world that surrounds us and tend to bring us home. The artist's own reflection in her artwork is the ultimate representation of American life."